This is the first time I've ever participated in Bout of Books. I'm not sure what I'm doing or what to expect. Ah well, I'm jumping in anyway! I know that I'll be reading (DUH!) and I'll probably rock some challenges. I hope to meet new folks and do a bunch of commenting as well. This will be my master post and I'll update it whenever I feel the need. (Daily? Beats me!) Now I'm going to go visit some other Bout of Books participants so I can steal borrow their formats and see how they go about this event. At first I was all confuzzled about this event. What am I supposed to do? Where should I go? Well, silly Jennifer, it's as easy as 1 2 3! Just read more, do some challenges. Big whoop. Not sure what I was worried about. Thanks for your comments gang, you made me feel better about jumping in. I'm not keeping a detailed page count since I've been reading a combo of tree-books and e-books. That would involve math. Math makes me sweaty. On Monday I finished up Beyond the Pale by Elana Dykewomon. Um, don't know where this MASTERPIECE was hiding for the last 10 years but I'm so glad that I got my hands on it. Tuesday's book was The Affairs of Others by Amy Grace Loyd. It was a fast one that I was able to gobble up quickly. I mostly liked it. There were some wordy sections that made me want to skim. BUT I DID'NT because I am a PROFESSIONAL READER DAMMIT. Last night I started the chunky Five Days in Memorial by Sheri Fink. It's 576 pages of nerdy nonfiction goodness and I already know it's going to be right up my reading alley. It won't allow for a quick read but I don't care! Keep on keepin' on readers. Go conquer those books. I've never participated in Bout of Books either. Good luck and have fun! Thanks Brooke :) So far, so good! Have fun! I've never participate either and don't have time for whatever it is this week -- but I'll follow along with you and maybe next time I'll know what I'm doing! There you go :) Maybe we'll see you around next time! This is my first Bout of Books too. Mostly I'm looking forward to a week of choosing to read and having an excuse to do so. This is only my second and I'm already hosting a challenge! It's super easy. Read. Write about it. Jump in the twitter chats (there's one at 1 PM CST today, I think). Meet people. Read MORE. Hope you have fun!! I just made a Bout of Books page, and I update that page (and keep linking it up) as I see fit. That's about it. Rebecca has it down pat! Good luck with your Bout of Books. I haven't done that challenge, but anything similar to readathons can be fun. Enjoy. Yup, any excuse to read a bit more than usual is fine by me! Good luck to you! Bout of Books is a lot of fun. :) I hope you enjoy it! Really there is nothing to be confused about. Just bob from blog to blog and network and do all the things that makes it fun and you will love it! Good luck on your goals. Sounds easy enough! I think I'm going to have a good time with this! I think I'm going to go with the Master Post idea. And I'll be making YouTube vids I can link up. Hooray for us! :D Same to you! I was a little confused at first too, but it looks like you can check in however you want. I think I'm going to use Twitter mostly (and services tied to it) and then do a wrap-up on the blog. Have fun! Seems pretty laid back which is great. That's what I need :) You have fun too girly! I *might* do this next time. Goodluck and I hope you enjoy it. I'm a little confused too -- it seems like there's a lot of things to do, but then also not a lot to do except read? That's what I'm doing, anyway... just reading and keeping track of pages. Have fun! I did it for the first time in May and now I'm hooked. I don't know how much I'll actually get done this week due to some real life things, but I couldn't stand the idea of sitting it out completely. Good luck and have fun! I hope the real life things aren't too distracting Charleen! I won't be doing much different than I normally do, which is to read whenever I have a spare moment ;) I'll be trying out some of the challenges though. I was a little confused last time, but I just updated from my goals page, followed along on Twitter, visited and commented. And read. I think you got this. I hope you get loads of reading done this week! I had to bail out, considering I won't be getting any reading done this week. 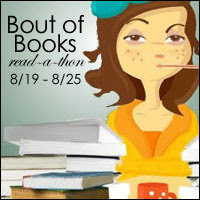 Bout of Books sounds much more overwhelming than it is because of the sheer amount of people who participate in it! But basically just read and blog more than you normally do and do it with a purpose. Oh, and enter some giveaways ;) Good luck! That's probably what intimidated me. It seems like an overwhelming event ;) I think I have a grasp on it now! No, but seriously, relax. Have fun. Read. Jump in and chat. Comment here and there. It's totally no pressure, but with that really fun feeling of reading at the same time as oodles of other people. I've been super laid back about it all...well, since my first I'm SO CONFUSED post anyway, lol. It's my first time as well and idk what I'm doing either. I know I won't be doing any challenges because I won't have time but I can read 3 books... I hope. Good luck. Let's just read and read :) I did do a few challenges..but I'm not killing myself to get to them, lol. YAYYYY so happy you're joining! It's so much fun! I'm participating for the first time too! Good luck, and happy reading! My only real goal is to read more pages per day than my average -- 70 pages vs my usual 50. Rocking it so far, thanks to a really great book! I don't know what my daily average is but I'm trying to sneak in even more reading than usual ;) So far, so good! Thanks so much Mandi! :D I'm having a good time, hope you are too! Happy reading this week... It's been fun so far! I'm taking your advice Ellie, no math for me. It hurts my head ;) Thanks a zillion for stopping by! Hope you're having a great week! It looks like you caught on and moved ahead full throttle. Way to go! Thank you, thank you! I got quite a bit of reading done this week, yay!